Despite the wealth of evidence that gender diversity makes good business sense, a significant gap persists. A 2016 study of almost 22,000 firms across the globe found that while having a 30% share of women in the C-suite was linked to 15% more profitability, more than half of those firms had no women in the C-suite at all. Other research has shown that companies with strong female leadership generate higher returns on equity, higher valuations, stronger stock performance, and higher payouts of dividends. Yet, only 19 of the Fortune 500 CEOs – 3.8% – are women. So what can companies do to get more women into the upper ranks? Emerging trends suggest that a host of new tools, enabled by advances in technology, are increasingly empowering professional women on the job market. For example, startups like Hired and Doxa provide transparency on companies’ gender practices, including salary gaps and female-friendliness of company cultures. The proliferation of social media networks, such as Levo League, enables women to virtually connect and take action together on key issues. As important as these tools are for getting women hired, providing opportunities to develop skills on the job is also a critical piece of the puzzle. Today, thanks to sophisticated new tools and platforms, high-quality learning experiences can take place outside of the traditional classroom setting. Forward-looking companies can now harness the power of digital learning solutions to offer their female leaders unprecedented flexibility, business impact, and visibility. One of the more obvious benefits of digital learning is its flexibility; learners can access it through the internet, take it with them on a portable device, and use it outside of typical work hours. In a recent survey of 379 business leaders who had completed ExecOnline programs, 94% reported that they found digital learning “better” or “much better” than in-person learning at fitting in with their schedules, and 86% found it less disruptive to their work life. While all leaders appreciate and benefit from flexibility, it’s a particularly valuable component to women. Many may be starting families while they advance in leadership roles, making the added logistical demands of traditional in-person learning especially challenging. Indeed, 85% of ExecOnline alumni found digital learning less disruptive to family life, as it allows leaders to fit learning into their existing set of responsibilities – work and home alike – rather than requiring them to be in a certain place at a certain time. Data from CEB suggest that women leaders also need to temporarily take time off work for family reasons at a much higher rate than men, and enabling women to “reactivate” – i.e., ramp back up – is a key step to ensuring that they have access to the same leadership opportunities. By providing flexible learning options, companies can equip their women leaders with the tools to do so. The reality is that any training must have business impact in order to be effective. To advance women in leadership, companies must enable them to demonstrate their impact on the organization. A significant drawback of traditional one-time, in-person training experiences is that the learning may take place long before – or after – learners need to use it. As a result, it could be forgotten entirely by the time they encounter a relevant business problem. Digital learning, in contrast, can be woven into leaders’ workflow and priorities; they can access knowledge and training exactly when they need it and then apply it in the moment, enabling more direct impact on the business. One challenge that many companies face in demonstrating women leaders’ impact is measuring their development in a tangible way. As the blended learning ecosystem continues to expand beyond the in-person classroom environment, measuring learning becomes even more difficult. In fact, Brandon Hall Group’s 2016 State of Learning study found that most companies fail to measure learning strategically, in a way that truly identifies the impact of the learning; only 43% of the 367 companies surveyed had a learning strategy that was even somewhat linked to business strategy. High performing companies were more likely to measure whether training participants had applied what they learned and achieved the desired outcomes. Fortunately, emerging technologies in learning platforms and employee management software are providing more tools than ever to quantify learning outcomes. Forward-looking companies use analytics to uncover insights about not only learning itself, but also how that learning impacts the business. As a large body of research has shown, it’s not enough for women to develop skills and competencies as if in a social vacuum. Companies need to empower women with visibility throughout the organization and increase the likelihood that others will recognize their impact. On the surface, this may seem like a clear advantage of in-person modalities; they can offer visibility and networking opportunities, enabling women to interact directly with more senior leaders in the organization. However, our data suggest that digital learning can also provide visibility by addressing a real business issue in the organization. Twenty-five percent of ExecOnline alumni, who as part of their course complete a real business project within their span of control, reported that their project helped give them more organization-wide visibility; 13% said it helped give them more visibility with senior leaders. 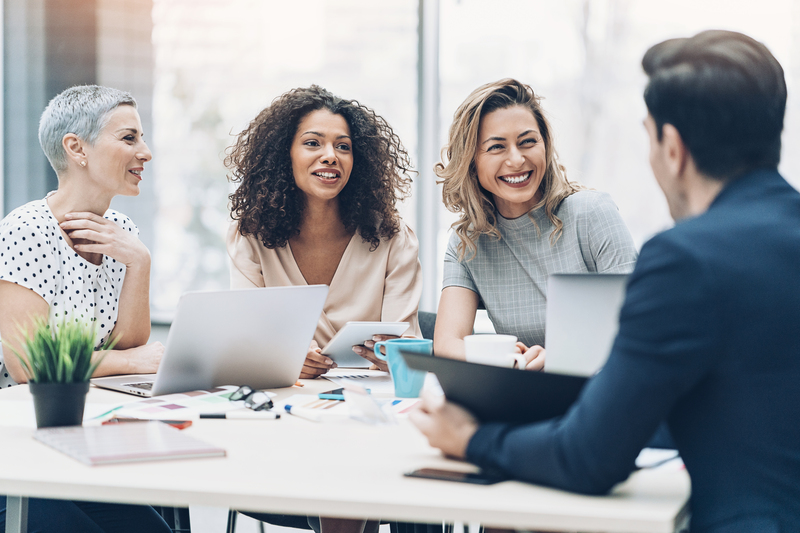 Other focused and applied projects, like Capstones, can also provide women leaders with opportunities to address influential business challenges and gain visibility in the organization. The companies that offer women a level playing field will enjoy not only better business performance, but also a strong reputation in the talent market. To learn how ExecOnline can help you develop gender diversity and leverage it to improve business outcomes, check out Fostering Inclusion and Diversity with Yale School of Management or email us at info@execonline.com.